Entire text of the homily of Fr. 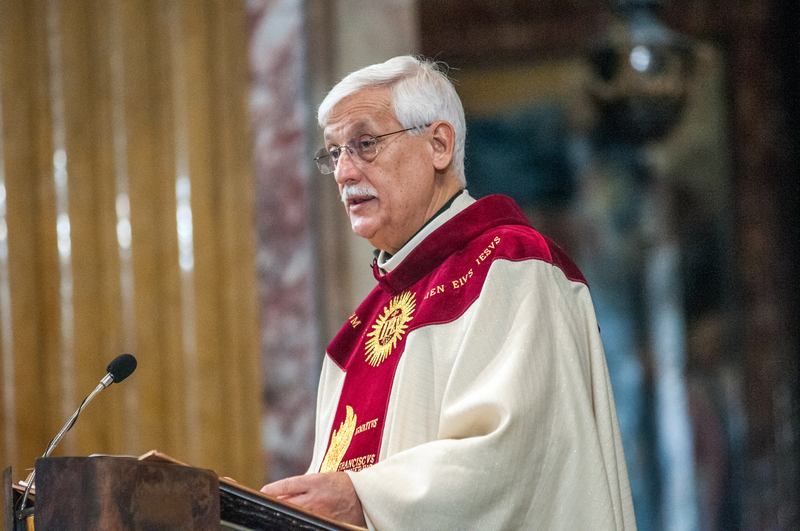 Arturo Sosa, SJ, on the occasion of celebrating and giving thanks for his election as Superior General of the Society of Jesus. A few days ago, in this very Church of the Gesù, where the remains of St. Ignatius and Pedro Arrupe are laid to rest, Fr. Bruno Cadorè invited us to have the audacity of the improbable as the distinctive stance of persons of faith, who seek to bear witness to such faith in the complex reality of human life. He invited us to leave behind our fear and to row out into the deep, as a kind of attitude for being at once creative and faithful during the General Congregation. Certainly, the audacity that we need in order to be servants of the mission of Christ Jesus can flow only from faith. For this reason, our gaze is directed first of all to God, since you have only one Father, and He is in heaven, as the passage from the Gospel which we have just heard reminds us. And as the Formula of the Institute reminds us at paragraph no .1: “Let (the Jesuit) have before his eyes, as long as he lives, before anything else, God, and then the form of this his Institute.” In fact, it is the whole heart that we wish to have in tune with the Merciful Father, the God who is only Love, our Principle and Foundation – the heart of each of us and also the heart of the body of the Society. If our faith is like that of Mary, Jesus’ own mother and the Mother of the Society of Jesus, our audacity can go even further and seek not only the improbable, but the impossible, because nothing is impossible for God, as the Archangel Gabriel proclaims in the scene of the Annunciation (Luke 1:37). It is the same faith held by St. Teresa of Avila, or St. Teresa of Jesus, whose memorial we celebrate today. She too, without fear, entrusted herself to the Lord in order to undertake the improbable and the impossible. Let us ask, therefore, for this faith from the Lord, so that we, as the Society of Jesus, can also make our own the words of Mary in her response to the extraordinary call that she received: “Behold the servant of the Lord: Be it done to me according to your word.” Like Ignatius and the First Companions, like so many Jesuit brothers who have fought and who fight today under the banner of the cross, in service only to the Lord and to his Church, we too desire to contribute to that which today seems impossible: a humanity reconciled in justice, that dwells peacefully in a well-cared-for common home, where there is a place for all, since we recognize each other as brothers and sisters, as sons and daughters of the same and only Father. With our hope placed in God and in God alone the General Congregation will proceed with its deliberations and it will contribute to its duty to preserve and grow this whole body (Const. 719). The preservation and growth of the body of the Society is tightly bound to the depth of the spiritual life of each of its members and of the communities in which we share life and mission with our companions. At the same time, it is necessary to have an extraordinary intellectual depth in order to think creatively about the ways in which our service to the mission of Christ Jesus can be more effective, in the creative tension of the Ignatian magis. To think about ways of deeply understanding the unique moment of human history in which we are living, and to contribute to the search for alternatives for overcoming poverty, inequality, and oppression. To think so that we never cease posing pertinent theological questions, and so that we continue to deepen our understanding of the faith that we ask the Lord to increase in ourselves. We are not alone. As companions of Jesus we too want to follow the journey of the incarnation, to identify ourselves with the human beings who suffer the consequences of injustice. The Society of Jesus can develop only in collaboration with others, only if it becomes the least Society that collaborates. Let us be attentive to the linguistic pitfalls here. We want to increase collaboration, not just to seek that others collaborate with us, with our own works, only because we don’t want to lose the prestige of the position of who has the last word. We want to collaborate generously with others, inside and outside of the Church, in the awareness, which comes from the experience of God, of being called to the mission of Christ Jesus, which doesn’t belong to us exclusively, but which we share with so many men and women who are consecrated to the service of others. In the journey of collaboration, with the grace of God, we will also find new companions to increase the number, always much too small no matter how great, of collaborators who, along with the others, are invited to be part of this body. There is no doubt about the need to increase our prayer and our work for vocations to the Society, and to continue the complex commitment to provide the formation that makes of them true Jesuits, members of this multicultural body that is called to testify to the richness of interculturalism as the face of humanity, created in the image and likeness of God.